Don Rosenthal enjoyed a distinguished swimming career that spanned four decades (1946-1979). He first gained attention as a high school All-America swimmer in his hometown, Cincinnati, Ohio. After graduation in 1950, his family moved to Southern California, where he swam for Santa Monica Community College. At SMCC, Rosenthal established five National Junior College swimming records, and lost only one race in his entire JC career. He was named All-America in 1951 and 1952, the two years he competed at SMCC. 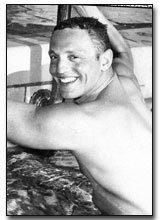 In 1951, Rosenthal was ranked 5th in the World in the 100-meter freestyle. Between 1951 and 1956, he held all Southern California Pacific AAU records for 50 and 100-meter races. Rosenthal was selected to the U.S. 4th World Maccabiah Games Team in 1953, and won two gold medals in the Holy Land competition--a triumph in the 800-meter freestyle relay, and a Maccabiah record victory in the 100-meter freestyle. In 1955, Rosenthal was named to the AAU All-America Team. From 1956 to 1958, he swam for UCLA’s varsity swim and water polo teams. Because of NCAA sanctions levied on UCLA athletes, Rosenthal was not eligible for All-America recognition, although his times qualified him for the honors. Don Rosenthal’s career includes 37 years as a Los Angeles City and County lifeguard, where he competed in many ocean swims and won numerous titles. From 1973 to 1979, he competed in the Masters Swimming program, and held national records for the 50 and 100-meter freestyle in his age group.